What to do when you have a bag of fresh Georgia peaches? 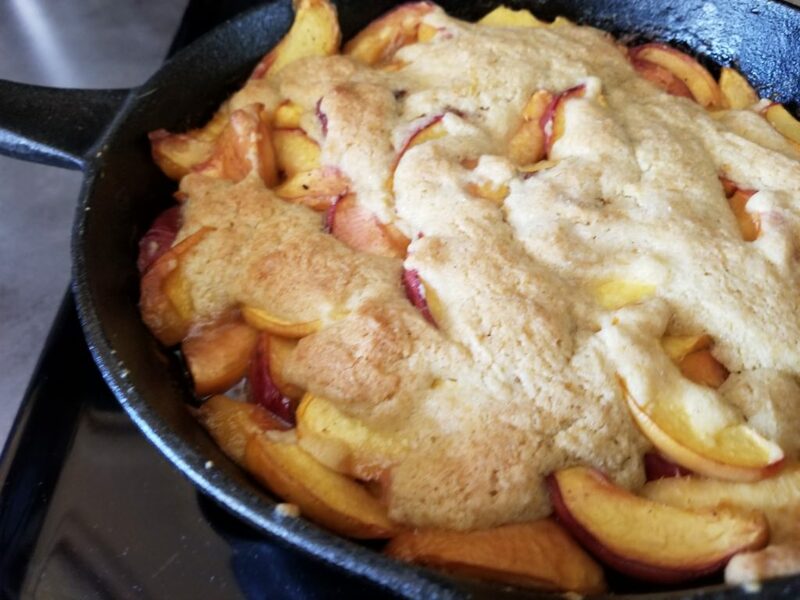 May cobbler on the Traeger, of course! 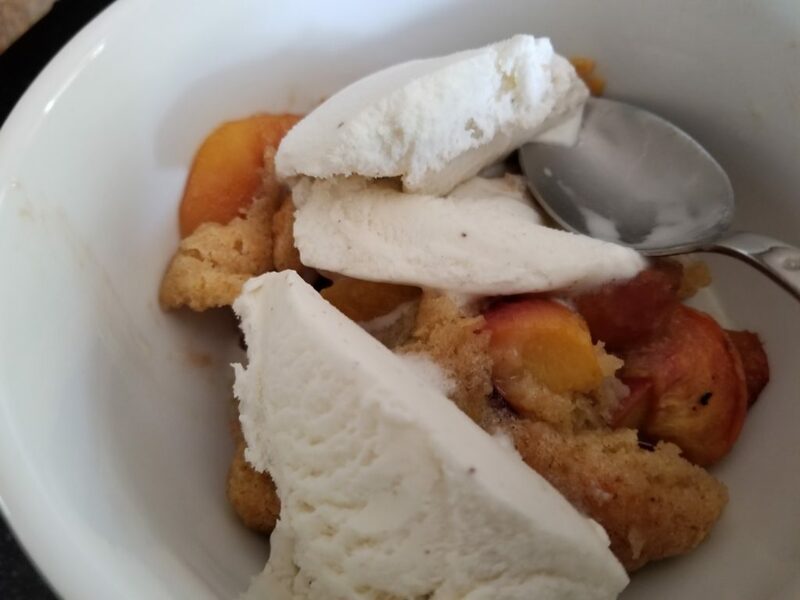 I got the peaches at the farmers market and thought this would be a good way to use them. The Traeger adds a little smoke flavor for a unique taste. Be sure to use a cast iron pan – this adds to the flavor and cooks evenly on the grill. This is a great way to cook a dessert in the summer. No need to crank up the oven and heat up your house on a hot summer day. After 35-45 minutes at 350 degrees you will have a dessert to be proud of!! This is a great finish to a meal of BBQ chicken, Cheers! When ready to cook, start Traeger according to grill instructions. Set the temperature to 350 degrees F and preheat, lid closed, for 10 to 15 minutes. Coat the inside of a cast iron pan with 2 Tbsp melted butter. 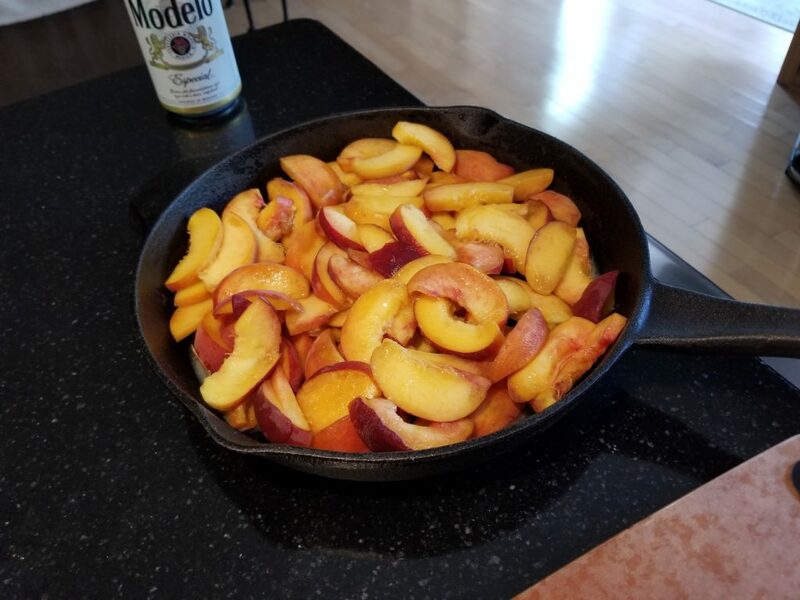 In a medium bowl, toss peaches with Smoked Simple Syrup and place in the prepared cast iron pan. In a small bowl mix together flour, baking powder, cinnamon and salt; set aside. In a separate bowl, cream the butter and 1/2 cup sugar. Add egg and vanilla extract. Gradually fold in the flour mixture. Spoon batter on top of peaches and sprinkle the top with raw sugar. Place the cast iron in the grill and bake for approximately 35 to 45 minutes. This entry was posted in Baking, Grilling. Bookmark the permalink.